I use it at the gym and love it! Small, compact and fits great in my gym bag. It does the job and quickly! This product is perfect. It folds and fits neatly in the cabinet under my bathroom sink. The dual temperature control allows me to choose what is best for my hair at any time. Great product for little money. I love this hair dryer. It is small with a lot of heat. Way to go Conair. Very small and very powerful! Perfect to fit into any bag for any vacation. Love the dual voltage, nice long cord, and that it is a folding hair dryer. Wish it had a "cool shot" button, but not enough to disappoint me with this purchase. Conair makes good hair dryers, and I expect that this will not be any different! 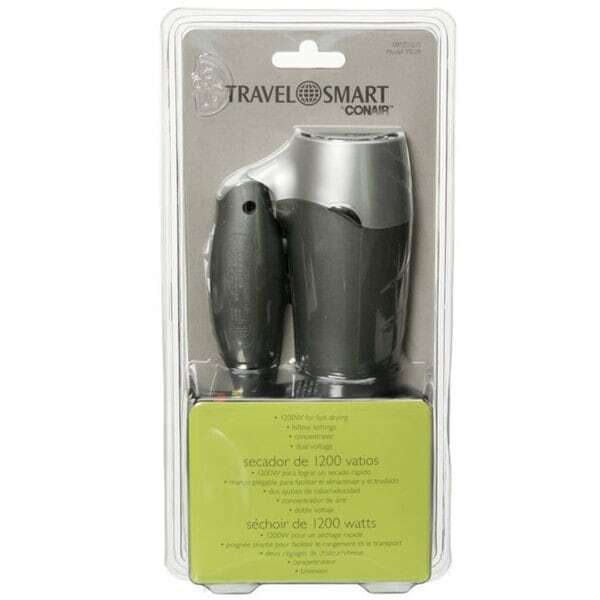 Small, compact, dual voltage ideal for travel. WOW! I'm amazed that something this small can be this powerful. It is the perfect little traveling dryer to throw in a suitcase or carry in your RV. Takes up no room at all! I've never owned one this small that worked so well. Great price, great product. I highly recommend. My boyfriend lives in a different town...instead of packing up my hair dryer when I travel to see him I can take this one. It folds up easily and fits in a pocket in my bag. It has enough to power to dry my very long and thick hair. I purchased this Conair travel folding hair dryer on 1/28/19; it worked fine until about a week ago. The motor went out on it and started overheating. I am very disappointed in this product. I would NOT recommend anyone buying this product. I had a portable hair dryer years ago that lasted over ten years, so this is totally unacceptable that this one lasted only 2 months! This dryer was compact for travel as it is designed for. It was a gift for my world traveling daughter. She took it and used it some, but she told me that it recently quit working. She’s had it a few years and travels more than the average person. I love the size of this blow dryer and how compact it folds up only taking s small amount of space in my bag. For those who travel out of the country, I like the adjustable wattage. Lite weight,,, compact to fit nicely in luggage. Works well. Exactly what i was looking for. Needed a small dryer for travel, Great price. got a strand of hair caught in the dryer which killed it in a handful of uses. Very dissappointed. "Is this hair dryer dual voltage?" "What is the weight of the hair dryer?" The weight is approximately 8 ounces. "Can this hair dryer be run on batteries?" No, this is not battery operated. "I now know the dimensions, thanks! forgot to ask if it's for USA outlets ... as in voltage. Jane Kerr"
The dryer is not available at this time. "what are the dimensions of this hair dryer? Jane Kerr"
Traveling soon and Conair is my favorite brand. I got one for myself and it it so light weight, and works well. My daughter liked it so I thought I'd get her one. "Is there a diffuser that fits this hair dryer? Traveling to Italy and need one." The hair dryer is not available.